This Light Award is sponsored by Christopher Westra Apps and processed through Kiva.org. Tania is a 26-year old, entrepreneur who is married and has two children, ages 7 and 5. Her husband works in day laboring. 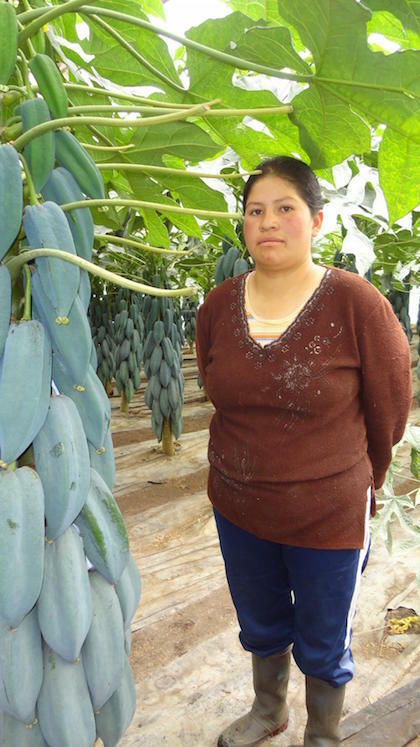 Tania has a small greenhouse where she grows babaco (fruit similar to papaya). This is the job that Tania has to earn a living. She currently has 85 plants which produce 20 to 30 fruits. She sells them to the fruit stall grocers. Tania wants to grow her business. She is asking for a loan to buy babaco (fruit similar to papaya) plants, fertilizer, plastic and disinfectants. This will increase her production, and increase her income that will serve for her children's education. She can save up to be able to buy land to start growing blackberries. Congratulations to Tania in Ecuador..!